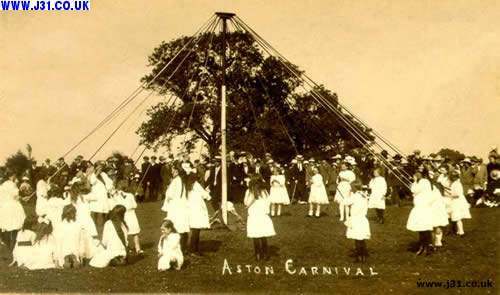 This picture was sent by Rodney Shaw and shows a maypole dance in Aston circa 1920, presumably on Mayday (May 1st). Maypole dancing may have its roots in pre Christian history as a fertility dance to welcome the coming summer - it could therefore be an echo of a truly ancient North European ritual. Curiously Mayday was one of the few pagan festivals to not be adopted into Christian festivals.It was however adopted by international socialist and communist movements when in 1889, a congress of world Socialist parties held in Paris voted to support the U.S. labor movement's demand for an 8-hour day on May 1. Afterward, May 1 became a holiday called Labour Day in many nations.